With 20 years of Durham landscaping design and landscaping installation experience, Natural Designs provides the technical expertise to assess your site and address the practical issues of existing plantings, light, space and drainage. In developing both concept and style, we first look towards our client. 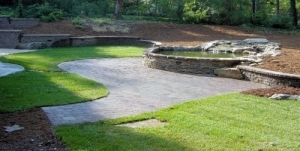 Natural Designs is owned and operated by Michael Kopcienski, a registered landscaping contractor, who will completely design and install a landscape for you in Durham. Our designs are comprehensive and will address your entire needs while offering a fantastic, aesthetically pleasing place to relax, dine, entertain and more. Whatever you are looking for, Natural Designs brings a special touch, with years of Durham landscaping experience and a history of outstanding customer service. I believe you are the top landscape gardener in all of North Carolina!! I wish you much success in all of your endeavors. Had a patio/landscape project (11/09) that morphed into including the driveway. Mike had no problem with the change in scope of work. The end result was better than envisioned. Work started on schedule and there was no down time except for rain. Natural Designs workmanship was first rate. Neighbors walking by still comment on how beautiful our front yard looks. Would use them again for any landscaping we plan to do.